The Bajaj Pulsar RS200 is out. Not only does it look fantastic and distinctive, it also seems like a value-for-money proposition. The bike is packed with features like twin projector headlamps, daytime running lamps, a comprehensive instrument cluster (comparable to or even better than the Dukes), four-valve triple spark engine that makes nearly 25PS, single channel ABS. Makes it a definitive winner, then? Not really. Because we are yet to ride the motorcycle, we'll reserve our comments on how the powertrain and other bits feel. But till then we can see how the bike fares against its contenders just on the spec sheets. 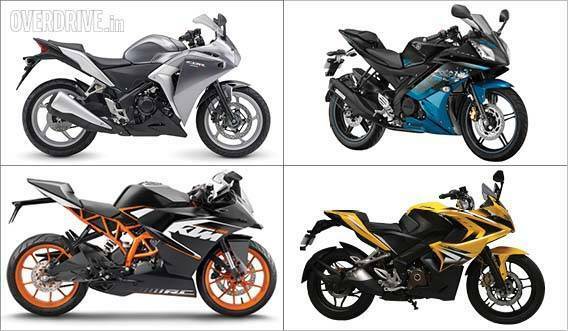 If you are in the market for a supersport styled motorcycle within Rs 2 lakh, what are your options? For starters, the Hero Karizma twins don't even make this list unless you are on a tight budget and are a big Hero fan. So we skip to the next option, the Yamaha R15. While the entire package resembles a big motorcycle, the R15 has everything going for it, except for maybe an increment in the power and a couple of missing features. Then there is the Honda CBR250R, a motorcycle which was a hot seller initially but sales have now tapered off with fresh and more reasonable competition stepping in. Finally, another newly launched motorcycle, the KTM RC 200. Similar features as the Pulsar but perhaps more racy in nature. Who wins this specifications comparison? Let's find out.